2013 was a major year for the search engine optimization industry. Google made a number of significant updates to its mysterious algorithm and SEO companies everywhere have had to change their approach to adapt. But that’s the life of search marketers – the onus is on us to adapt to these Google updates in order to continue bringing in the results for our clients. We’re running through some of the major ones here in case you missed them. One of the most Google updates this year is its decision to move to encrypted or secure search for all queries (previously, your searches were encrypted only if you were logged in to your account). This means that you will no longer know which keywords people are using to find your blog. This makes life so much harder for SEOs because you can no longer drill down your organic traffic to the keyword level. It’s not only Google, but Yahoo! and Bing are also making moves to mask keyword referral data. We can no longer run reports such as ‘Branded vs Non-Branded’ keywords, ‘Head Terms vs Long Tail’ keywords and so on. Basically, all keyword-level reports are no longer reliable. This represents a major problem for SEO companies in Malaysia mainly because most small and medium business owners here are still asking for keyword-level monthly reports. Although there are still ways to identify which keywords are more important, they are less definitive than what was previously available to us. Google’s Panda update was first released in February 2011 and attempts to weed out low quality websites such as content farms or scraper sites. Google released a Panda update (number 24) in February 2013 that affected roughly 1.2% of English-based search queries. Just a few short months later, Google released yet another Panda update but announced that from then onward, Panda will be rolled out slowly over approximately 10 days rather than all at once. The head of Google’s web spam team, Matt Cutts, has also mentioned that Google is looking for additional quality signals that may soften the impact for sites that are in the ‘grey area’. Among the most significant Google update this year was with regards to the Penguin filter. As we all know, Penguin 1.x was a major gamechanger in the industry that punished SEOs who manufactured links with wild abandon. However, this first iteration of Penguin only looked at links that pointed to your home page. With Penguin 2.0, Google began penalizing links that pointed to the deeper pages of your website. While it still affected the same kinds of link spam as its predecessor, it signaled major structural changes to how the algorithm worked. Penguin 2.0 affected approximately 2.3% of English-based queries. And when Penguin 2.1 came along in October, it seemed to affect even tiered link builders by following the links upstream. Tiered link building is a much-favoured tactic by many grey and black hat SEOs. It’s much easier to create your own link networks for contextual links rather than having to create great content. Google’s Hummingbird update represents a major structural change to how the search engine works. Unlike updates such as Panda and Penguin (which are separate algorithms that sit on top of its main one), Hummingbird represents a major change in its main algorithm (similar to the Caffeine update in 2010). With Hummingbird, Google hopes to be able to better understand the context behind a particular search query. This provides greater strides in the direction of conversational search. For example, if you ask ‘Where can I buy Samsung S4 near my house?’, the algorithm will understand that you are referring to your location. Previously, it would have only looked at the keywords such as ‘buy’ and ‘Samsung S4’ and returned results that optimized for those. 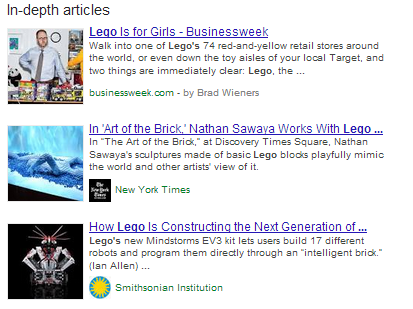 In August, Google announced the release of in-depth articles in the SERPs. This move was based on a research it conducted that suggest that 10% of users use the search engine to learn more deeply about a broad topic. I believe that this will have great implications in the future and you can read more about it at the link above. In a move towards a more merit-based Internet, Google has announced that it is going to be more selective in showing author’s rich snippets in the SERPs. Previously, you would have your photo displayed as long as you implemented the Google Authorship markup. Now, it’s only going to show for authors Google thinks are more authoritative for a particular subject matter. That’s only the beginning. According to Matt Cutts, the Big G is looking for even more quality signals in order to reward subject matter experts. Even though it was announced that there won’t be any Toolbar PageRank (TPR) update until 2014, Google surprised us by updating its TPR on December 6. Over the past year, there has been murmurings that Google wants to do away with TPR, but it seems like it’s here to stay, at least for a little while longer. Did We Miss Anything Out? Did we miss anything out? Which of these updates you think will have the most impact on SEO in 2014? Let us know in the comments below. ← What Colour is Your SEO HAT?